The "Do Nothing Day" is a day each week where your only goal is to hang out / relax / exist / just be. You try to do this: nothing! Or at least, you try to do very, very little. You’ll need to have your groceries and supplies pre-purchased and ready in advance. You and the family will try not to even leave the rented apartment for an entire day. Devote this whole day to lazing around, reading, watching TV, and napping – even the adults. You won’t regret it! If you have a yard, patio, or balcony, you could read outside, maybe play a little catch – but nothing so taxing as going to a museum, grocery, archaeological site, or even a restaurant. We have used this rule from time to time. We sometimes forget to do it. 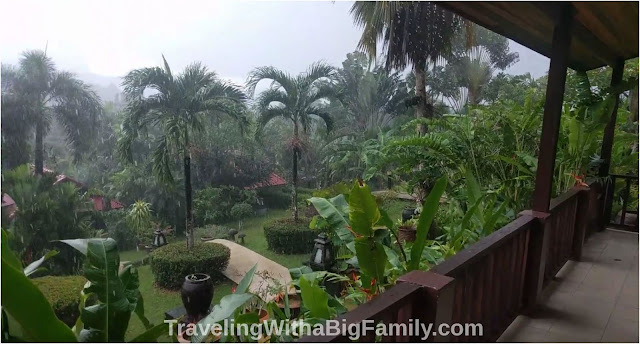 But for example, in Thailand, in one spot near the coast, the house had a 7-day minimum for guest rentals, and it looked so awesome that we booked it for 8 nights. We made sure to have enough food in the fridge that for a nice 3-day stretch right in the middle, it would not be necessary to leave the house, unless we really wanted to go out for some reason. The house was isolated, so planning to stay at the house for a few days was, on some level, a way of reducing expenses (since the one-hour round-trip to the nearest town added to the cost). But mostly this long stretch in a non-touristy area was an attempt to get some quiet family time. Time to just be together without trying to run around seeing Everything, Everywhere, All the time. We were staying within walking distance of a small, private beach. It was not “private” as in: owned and reserved exclusively for an elite property’s guests. Rather, I use the word “private” only because it was very isolated, and we never saw anybody else there. On this isolated beach in Thailand, we never saw any people - though we did see this sign that we weren't the only visitors to that beach. 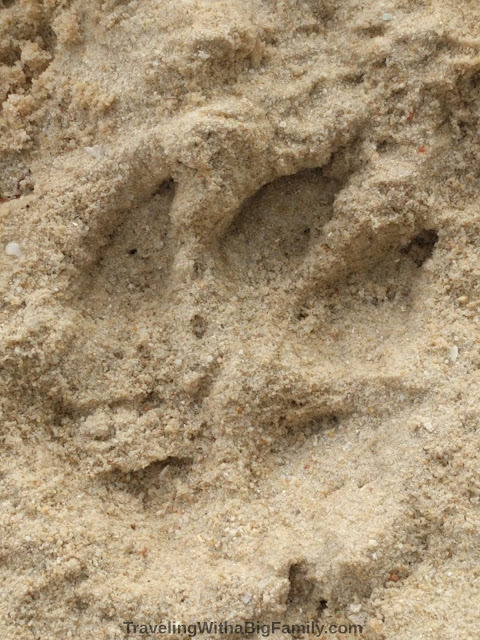 If anyone can identify that animal for us, please post your comments and guesses. Our Thai host said "Tiger, tiger" but with the usual big Thai smile, so he may have been pulling our chain. So even when we didn’t use a car at all, or go into the nearest city (30 minutes away), many of the days at that stop were very relaxing and slow-paced. But still, nearly every day we would go out and swim, or go out and kayak, or go out and visit the farmer’s market. There’s always something. It was the rainy season, but rain never altered our plans in any significant way. It might rain for a half hour, then let up, or stay drizzly, but not so much that you couldn't walk around in it. We didn't even bother with rain jackets. The rain was almost never a factor in deciding what to do. (On a really rainy day, we might spend part of the day doing an indoor activity, like the one in this post). The kids were surprisingly excited about it. They got out their sketchpads and books from home, and hit the sofas with gusto. They also got out all the small, portable travel games they had brought on the trip. A couple of weeks before the trip I had ordered them each one travel game: travel Battleship, travel Connect 4, travel checkers, etc. They played these little things a surprising amount of time on the trip, especially while in motion or when having some down time. I played them myself, more than a few times. 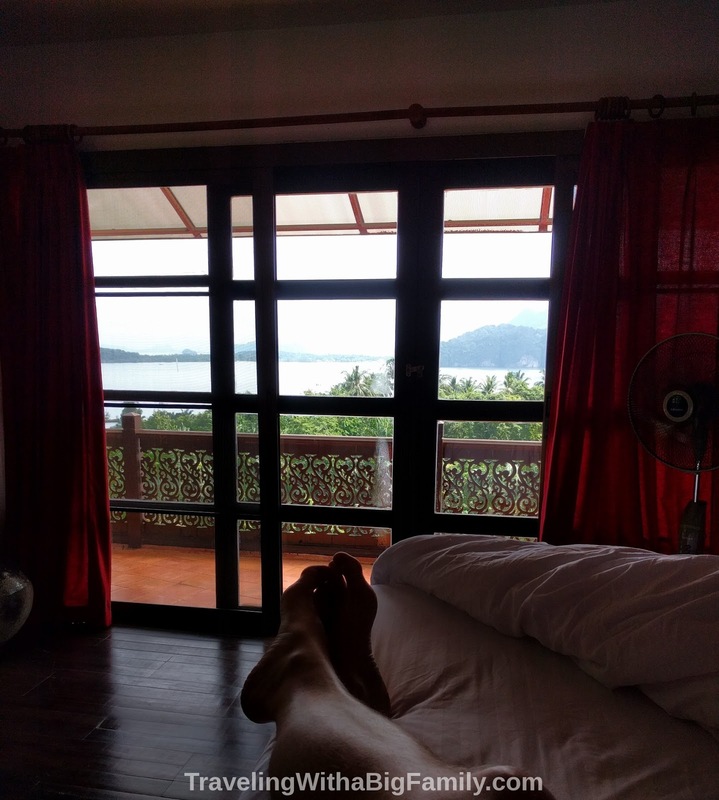 While they relaxed and played inside, my wife and I perused the coffee table books that the thoughtful host had left out for us – books written in Dutch (which we don't read), but featuring huge, full-page photographs of the natural beauty and geography of Thailand. Why aren't more days on a vacation like this one? The rain let up within an hour, but still, we decided to hang around the house that day. That day was mostly devoted to reading, card games, playing with games and toys, eating, napping - all good things like that! Do we travel to “see and do” everything imaginable? Or do we travel to spend a pleasurable time together with our kids and spouses? And, are these two goals mutually compatible? It's helpful to keep your travel goal(s) in mind when deciding how many nights to stay in each city (see this post for more on that). Skipping the "Do Nothing Day"
On our (kind of exhausting!) 3-week big family trip to Europe, I experienced 2 days out of the 21 where I had to make myself go to bed with no alarm, announcing to the kids that there would be a “Sleep Late Day" the next morning. That explains why I don't recognize those pink curtains." I'm someone who can generally operate on 6 to 7 hours every night - so a 10-hour sleep is a major recharge, and a sign that I'm over-stuffing our itinerary. I started feeling exhaustion within 4 days after leaving home. Our trip started with a 350-mile road trip to reach a major international airport hub, where our flights to Basel would cost hundreds less per person than from any closer alternative airport - which saved thousands, since there are six of us. Then we flew all day and most of the night - just under 5,000 miles (8,000 km), only to learn that our connecting flight for the last 500 mile (800 km) leg of the trip had been cancelled due to stormy weather in France. I considered booking a train ride but that was a long way to go as a spur of the moment decision - plus there was the little matter of getting across the English Channel, and half of France, to reach Basel. So we spent an unplanned night in the U.K. at a tolerable airport hotel, then traveled the next day to Zurich (where the kind airport agent re-routed us, rather than Basel, since we could get to Zurich a couple of hours sooner). Once in Zurich, we literally ran from the plane to train station. It was our first train ride so we had to stop and buy a certain kind of travel pass so the kids could ride for free (more on that in this post). I watched the time and the agent's keyboarding anxiously, then as soon as she finished we dashed off downstairs to search for our platform. We just barely managed to catch a train that pulled out seconds after we got on board, breathless, and amazed that we were leaving Zurich only some 15 minutes after touchdown! Then we rode on that train a few hours…Then went grocery shopping, with our backpacks on the sidewalk outside…Then rode a taxi 20 minutes to our rented home. All this in one day! And we all started to notice something that day: Wow, this is a long trip! And we were just getting started. This was before we really reached our first actual destination! 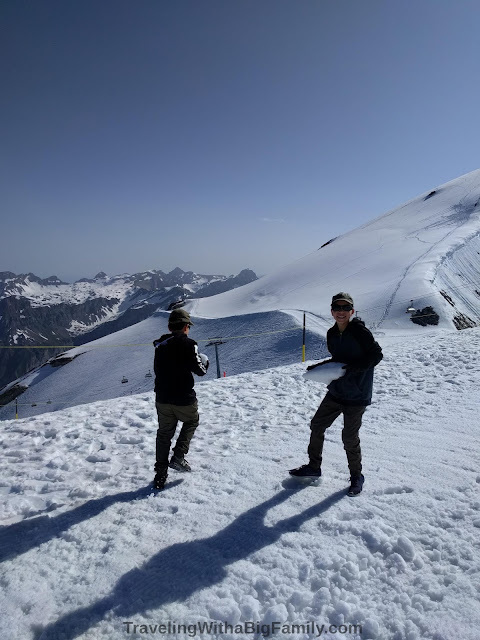 Then the very next morning at 8am, we were up in the Alps, at 10,000 feet (3,000 meters), where the air is thinner, and exhaustion sets in more quickly. So, after a long day of some serious Alpine snow play (one of the highlights of the trip, as discussed in this post), I was pretty much toast, and scheduled a "Sleep Late Day" when what we probably needed was a "Do Nothing Day." We did take some of that next day off, except for some light hiking behind the house...which, this being Switzerland, turned into something a little more intense than we had in mind! You can read all about that here. And the next thing we knew, we ended up not staying anywhere longer than 3 or 4 nights, and even had multiple 1-night and 2-night stays in some places. Halfway through that Europe trip we were all thinking, “Oh no, not another plane ride!” So now, for the second consecutive year, I’ve announced to my family that next time (it's always next time), we should just pick just one to two locations for our destination, and spend a minimum of 5 nights at each. There should be time on every single trip to put your feet up, with an icy drink at hand. Hey, if that’s your thing, you could arrange to do that every single day of a trip! To me, doing it that often sounds boring. But I don't know, as I've never tried it. I'm much more likely to be found scaling a Mayan temple in a steamy jungle that I am to be found napping in a hammock between the palm trees on a white-sand beach. But even on a trip to an exciting, exotic location – Bangkok or wherever – your big family will need time to rest. So we recommend making every week include at least one “Do Nothing Day." Take the time off, to recover from your trip – especially the moving, flying, train-riding parts of it. Take time to stop and just be: be there, be with your family, be fully present in where you are rather than where you need to be next. It is not possible or even desirable to try to see everything that your destination has to offer. Because you’ve brought the best part of any trip with you: your family. Do you schedule time off during your travels - rest days, break days, down time, or something similar? What's your idea for a way a family can relax and recover from a lot of long-distance traveling? Excellent post! I am guilt of squeezing too many events/sites/locations into our vacations. When we took our five children to Europe several years ago, we overdid everything. And now, the two youngest (who were then 9 and 11) say they don't really remember anything except the train stations, a couple of boat rides, the really long flights and a couple of minor things - crepes under the Eiffel Tower as it twinkled its lights, souvenir shopping in Venice. Mostly they remember an apartment we rented in Paris and a few specific meals. So much for our Switzerland, Italy, France, UK 21 day whirlwind. It was intended to be a lifetime memory. I whole-heartedly agree that "next time", we choose one fabulous place and explore it thoroughly. Happy travels! Ha ha yep I also wonder which memories stick for the longest, and why. Every time the Asia trip comes up, the very first things the kids mention is how they loved the flight on Korean Air because it had unlimited movies/video games in the seat backs! Thanks for reading!